When you’re looking to start building a social media campaign, it can be overwhelming. You know that you need social media analysis tools, but you don’t know where to start. Content creation. You need to come up with a steady stream and fresh ideas. Afterward, you need to sit down, organize these ideas, and create content. This can include blog posts, videos, infographics, and more. Content publishing. Once your content has been created, it needs to be shared with the world. Many tools allow this process to be automated. You need to take the time to decide if you want to use strictly free channels, or if you want to pay for additional exposure. Listening & response. Good content will open the door for conversation between your brand and its audience. You need to be prepared to listen to their responses and engage with them. Listening also means staying up-to-date on the latest trends. You should take advantage of them to create timely and relevant content. Content analyzing and comparing. The final step is carefully taking a look at your results to see what’s working and what isn’t. If you don’t know whether or not your efforts are working, you could be simply spinning your wheels. Unmetric works in tandem with vendors that provide publishing and listening services. Successfully managing every step of your social media process takes a variety of tools. You need to make sure they work together, complementing their strengths and shortcomings. Generally, there are three kinds of social media tools. Listening platforms, publishing platforms, and competitive analysis platforms. Separately, each tool tackles social media from a different angle. Together, they can help your brand achieve all your social media and business goals. Listening platforms include suites like Salesforce Marketing Cloud (which was previously known as Radian6). These platforms are able to monitor many different social media platforms to find out what’s being said about your brand. You will also be able to gather information on the latest industry news and trends. This information will help you a great deal when it comes time to create content. You’ll know what’s relevant to your audience, and what they care about. You can’t rely completely on listening platforms, however. In order to get a fuller understanding of the industry, you’ll need a complete competitive analysis. These tools will be discussed shortly. Publishing platforms help you spread your content to the world. After you’ve created your content, the last thing you want to do is spend time posting it. Platforms like HootSuite and Percolate allow you to share content easily, posting across multiple platforms at once. You can easily set a posting schedule, making it easy to share content regularly. While other tools are focused on users, social analysis tools focus on brands and industries. You will be able to track metrics that matter to your business. This includes analysis on first-touch, multi-channel, content, and timing. Most importantly, you’ll be able to analyze your competition’s content. This is what makes competitive analysis platforms like Unmetric so valuable. You’ll be able to get a strong understanding of what’s working throughout your entire industry. You can find trending topics and untapped niches with ease. Unmetric has gives users the access to the social media performance of over 30,000 brands across 30 industries covering all the major social networks. 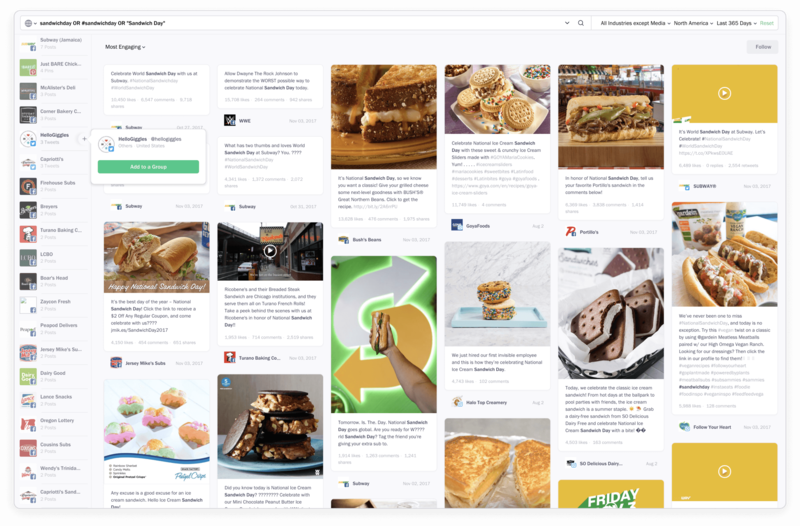 With one of latest features called Inspire, marketers can search through millions of pieces of content just like you would use Google to search for answers to your questions. Just key in any word like “Super Bowl” , “Christmas” or “Selfies” and posts and tweets which contain the word show up in matter of seconds which can be sorted in order of date or engagement. The feature is a boon for marketers as they can easily find content that works and draw inspiration for a campaign. There’s also a great deal of native tools offered by Facebook, Twitter, and more. These tools let you do a variety of things, like scan for mentions, consolidate social media accounts, and schedule posts. The problem is that none of these tools are all-inclusive. They capture incomplete bits of data, and won’t have as many options as other tools. They’re a good place to start, but not sufficient to give you the whole picture. It’s also worth noting that these tools are completely free for your competition as well. Using them will help you stay afloat, but it won’t give you a competitive advantage. If you want an edge, you’ll have to use more advanced tools, like Salesforce Marketing Cloud for listening and publishing and Unmetric for intelligence and benchmarking. Listening and analytics. You can use your listening tools to ping you whenever your brand is mentioned on social media. After you respond, you can use your analytics platform to find out if you’re responding quickly enough, and how your responses are received. Used in conjunction, you’ll ensure that you engage with your audience as effectively as possible. Publishing and analytics. If you use strong analytics tools like Unmetric, you’ll have access to a wide variety of information. You’ll know what type of content is working, where it’s working, and when the best time to post it is. You’ll be able to maximize your engagement score by using your publishing platform to publish at the best possible time, based on your analytics. Are Social Media Tools Useful for My Business? The good news is you don’t have to be on every single platform. Pick one or two that make the most sense for your business and start there. It’s better to have a strong presence on a single site than minimal presence on a dozen. 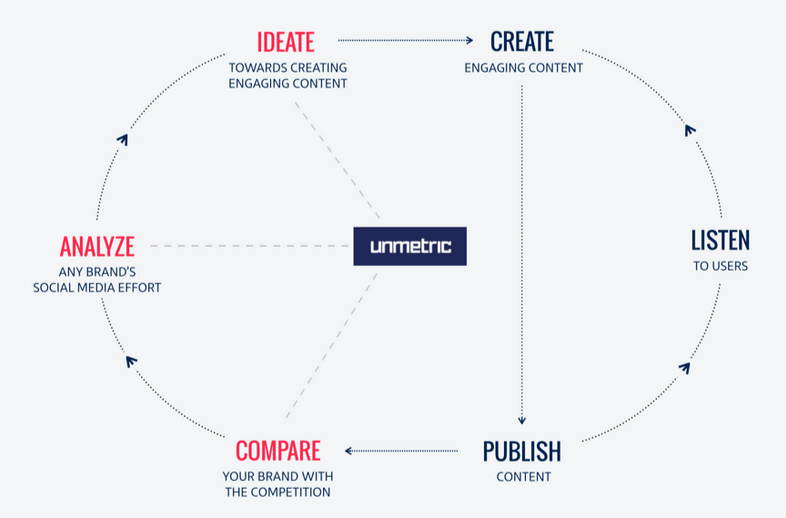 Give Unmetric a Try for Free! It’s clear how important social media tools are for any business. If you’d like to give Unmetric a try, click here to request a completely free 3-day trial! If you’re not the hands-on type, you opt for a 20 minute demo instead!